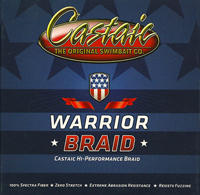 Developed by renowned lure manufacturer Castaic, this line has all the characteristics required for a great spinning and baitcasting braid. Bionic Bass Line is a tough, strong and durable clear monofilament that comes in weights of 4 to 15lb on 350 yard spools and 20lb on 275 yard spools. Bionic Musky / Pike Braid is a supple, no stretch braid ideal for lure angling. Coloured slop green, this braid has a low friction coating, casts further and sheds less water than traditional braids. This braid was awarded a Recommended badge of honour by the Luretour product review site.